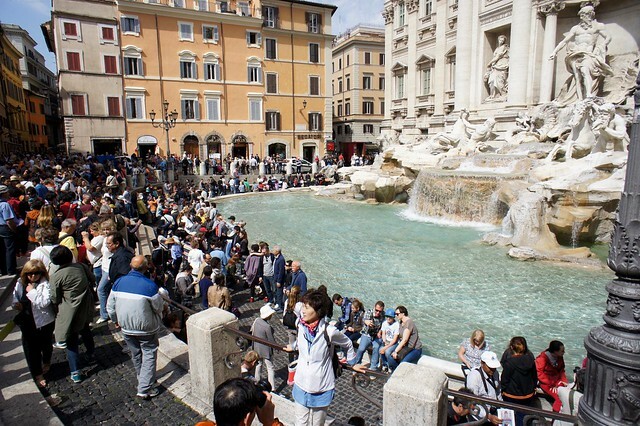 The Trevi Fountain was drained and closed to the public for most of 2014 and 2015 for a complete restoration funded by the Fendi fashion house. After its reopening last November, the travertine marble is back to its pristine original white, more than 100 LED lights have been added for a stunning nightime illumination, and Nicola Salvi's famous fountain is back to its original 18th century glory. This Baroque masterpiece, featuring statues of tritons and horses posed on rocks that seem to tumble from the palazzo facade behind, is one of Rome's most popular attractions, drawing crowds late into the evening who toss coins into the lowest pool over their left shoulder in hopes of guaranteeing a return to Rome. Fendi was able to show off the restoration as well as celebrate their 90th anniversary last week with a fashion show where the models walked across the fountain on a glass runway. 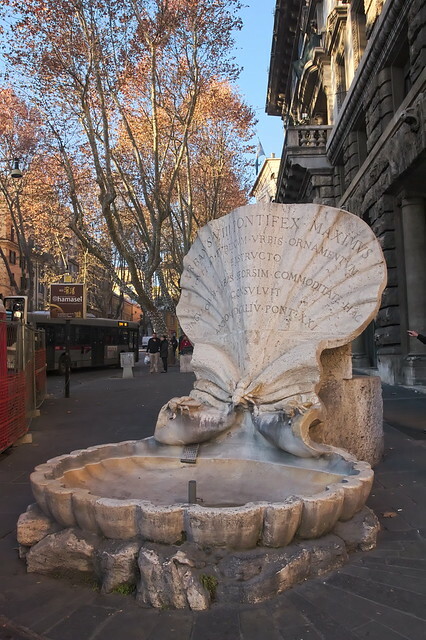 In addition to the iconic Trevi Fountain, Fendi also funded the restoration of the less famous Quattro Fontane (Four Fountains) as part of the “Fendi for Fountains” Project. 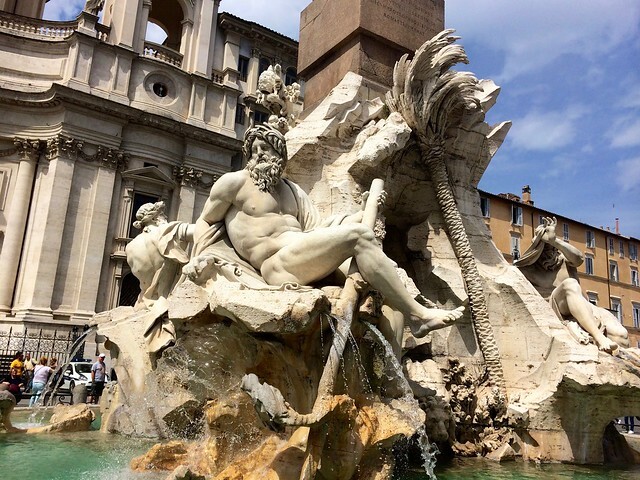 Located at the busy intersection of Via Pia and Via Felice near Piazza Barberini, the Quattro Fontane are more difficult to admire but are among Rome's most historic and beautiful public fountains, dating from the late 1500's. Two of Pietro Paolo Olivieri's four corner fountains represent the Tiber and Arno rivers, while two depict the goddesses Diana and Juno; all four had grown quite black over the decades from pollution and exhaust but were restored to their original white marble over a 9-month restoration in 2014. Most of Rome's largest squares feature an ornate central fountain, thanks to a papal project in the 17th century aimed at erecting a monumental fountain in each of the city's major piazzas. The Baroque sculptor Gian Lorenzo Bernini carried out many of the papal commissions for this project, and his masterpieces adorn three of Rome's most famous squares. Piazza di Spagna is home to Bernini's beautiful Baroque Fontana della Barcaccia, completed in 1629 by Bernini, representing a half-sunken ship. Tourists for centuries have stood on the small marble pedestals at the bow and stern of the boat to drink from the jets that spout water into the lower basin. This fountain became the subject of debate in 2015 when it was permanently damaged by Dutch soccer hooligans. In busy Piazza Barberini, the relatively simple Fontana del Tritone was the first of Bernini's free-standing fountains, completed in 1643 for Pope Urban VIII to honor the Barberini family. 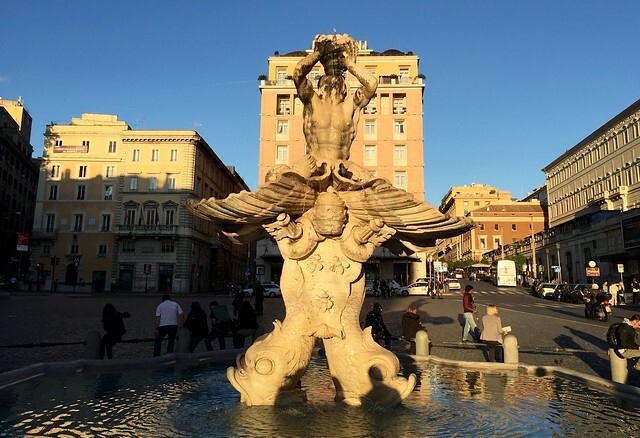 The design, featuring a massive triton atop four dophin tails with the papal symbols entwined with those of the Barberini family, introduced sculptural fountains, once limited to private villa gardens, into public urban spaces. Bernini's monumental Fontana dei Quattro Fiumi stands in the center of the large Piazza Navona, and was completed in 1651 for Pope Innocent X. Bernini was awarded the commission after having won a competition with his design of four sculpted river gods representing the major rivers of Africa, Europe, Asia, and the Americas, which were the continents where papal authority had spread. The fountain is topped by an ancient Egyptian obelisk. The rich alegorical detail and fusion of sculpture and architecture in this fountain contribute to its status as a masterpiece of Baroque art. Not all of the fountains in Rome are massive works of monumental sculpture...some of the prettiest are small gems featuring flora and fauna, or playful masks. The Renaissance Fontana delle Tartarughe (Turtle Fountain) in Piazza Mattei was completed in 1588 by the architect Giacomo della Porta and sculptor Taddeo Landini, but the most famous feature of this lovely fountain was added during a restoration in the mid-1600's by Bernini: four bronze turtles around the upper basin, for which the fountain is named. 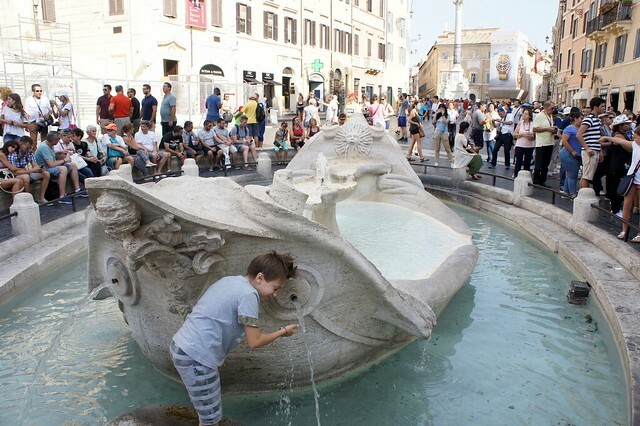 Another whimsical favorite is the Fontana delle Api in Piazza Barberini, constructed by Bernini immediately after completing the Fontana del Tritone and intended as a watering trough for horses. 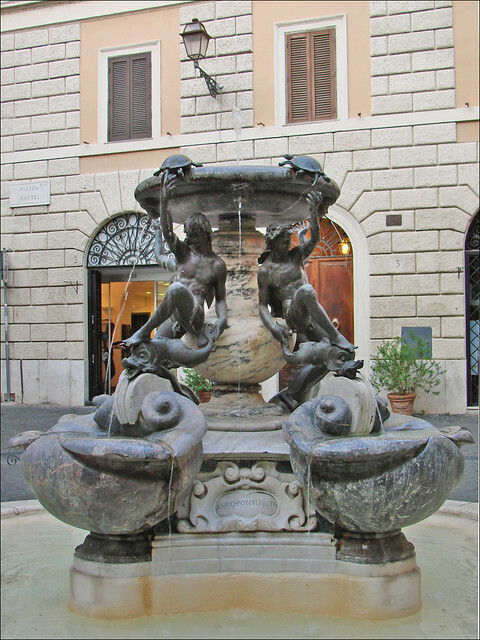 The three bees sculpted on the upper half of the conch shell, symbol of the Barberini family, gamely spout water into the shell-shaped basin below.